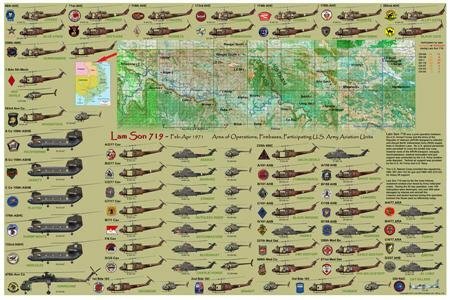 This highly detailed print depicts all U.S. Army aviation units that participated in across-border operations during this operation in February/March 1971. All units are represented with aircraft type, number assigned, markings, pocket patches and callsigns. Highly detailed area of operations map includes base camps and fire bases. LAM SON 719 by JOE KLINE (Helicopters: US Army: Vietnam:)@vbader.com/virginiabaderfinearts.